The UK is finally open to the cultivation of genetically modified crops. The granting of a licence for a single variety of genetically modified maize, to be used for animal fodder, has been confirmed by the government. The decision follows years of often heated debate, screaming headlines about "Frankenstein foods", direct action by protestors in white suits, and voluminous reports by several panels of experts. But it is clear the "farm gate" is now ajar and if biotech companies can show benefits for other engineered crops, the process is in place for them to get a licence for their new products. Dr Colin Merritt, biotechnology development manager for Monsanto UK, said: "This is a small step forward. "These crops are growing on millions of acres around the world where much more pragmatic steps have been taken much earlier." Some of the UK's leading figures in the biological sciences also welcomed Tuesday's announcement. Professor Julia Goodfellow is chief executive of the Biotechnology and Biological Sciences Research Council. 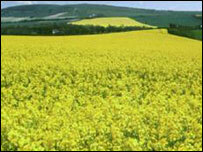 She said: "GM technology has great potential benefits for both the public and producers. "It is right that we assess each application of this technology case-by-case based on the scientific evidence while taking into consideration the understandable concerns regarding the use of this relatively new technology." And Professor Chris Lamb, director of the John Innes Centre, the plant research institute, said it was important the decision was based on scientific evidence, rather than campaigning rhetoric. "The lesson we must all learn from GM is that if society is to reap the benefits that plant science can bring, we need long-term, visionary policy-making that identifies what it is that society requires from agriculture and new plant-based industries. "Scientific knowledge and scientific method can then be applied to help meet those objectives". But the decision drew vehement criticism from campaign groups that had lobbied for a blanket ban on GM cultivation. "The government has given the thumbs up to GM maize, and shown two fingers to the British public," said Friends of the Earth's director, Tony Juniper. "In demonstrating its pro-GM credentials, the government has ignored considerable scientific uncertainties, shown contempt to Parliament and utterly disregarded public opinion." He urged the devolved governments in Wales and Scotland, which have a technical veto on GM cultivation, to block the new maize. And the Greenpeace GM campaigner Sarah North was incensed the government had chosen to ignore British public opinion. "Who on earth is Tony Blair listening to? He's given the nod to GM maize based on trials that anybody with a passing knowledge of A-level science would be able to tell you were flawed. "Downing Street should know that there are thousands upon thousands of people ready to fight him on this. The end result could be chaos in the countryside during an election year. Today isn't the end - it's just the start of it." The Conservative opposition spokesman, John Whittingdale, argued that the original trials, which gave the maize variety the all-clear, had now turned out to be flawed. He said the imminent withdrawal of the weedkiller atrazine used on the maize comparison crop meant scientists should go back to "square one". "The government should now conduct new trials to compare the effect of [GM maize] with its non-GM equivalent grown without the use of atrazine. The few trials that did take place were on too small a scale to produce any conclusive results." The official government wildlife watchdog English Nature has been sceptical of the benefits of GM throughout the debate on commercialisation and said on Tuesday that a precautionary approach should govern the plants' future development. "It is important that any impacts on wildlife of growing GM crops continue to be scientifically assessed crop by crop," said Dr Brian Johnson, English Nature's biotechnology adviser.